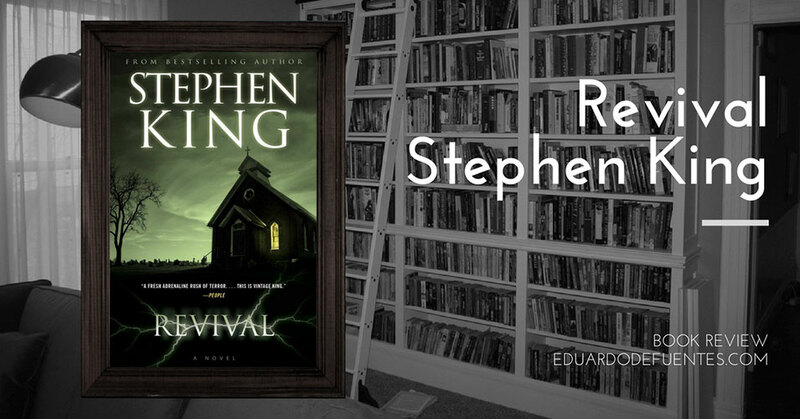 Stephen King’s Revival is a very difficult book to review and recommend without revealing too much of the story, especially its conclusion. In fact, Revival had been on my to-read pile since its release, but when my friend, and fellow Charmful Dead Things contributor, Waldo Cervantes told me about the story—with very little detail—and especially how much he liked it, I decided to put the book among my reading priorities before this year’s end. The story is told over the course of about five decades and goes back and forth between years. Jamie Morton grows up in a small town in Maine where he has his first encounter with the newly appointed minister, Charles Jacobs. Through his story, Morton joins a band, experiences first love, gets hooked on heroin and then is cured after a chance encounter with the same minister from his youth, Jacobs. By this point, Jacobs has all kinds of tricks up his sleeve—having abandoned God after an accident that took his wife and son, he experiments with what he calls the ‘secret electricity’, a power, that when harnessed, can cure many diseases and addictions. At first, it’s uncertain if Jacobs is nothing more than a hustler—it appears that way when he first tours the country taking strange photographs at amusement parks (a tiny connection to Joyland is made here, a much-appreciated gesture from Stephen King to his recurring readers) and then starts a new religious movement based on his ability to heal. Or maybe Jacobs isn’t a scam at all, and he has actually tapped into an otherworldly power—the ‘secret electricity’—like the world has never seen before. As Jacobs and Morton meet each other through the years, the novel speeds through to a conclusion that is utterly devastating. In my opinion, the last fifty pages of Revival are a total delight. In them, we’re given an H.P. Lovecraft inspired ending to a fantastic story that is, frankly, quite grim. King keeps giving you hope throughout the book, only to rip it like flesh from the bone at the end…and it’s wonderful! This ending is the novel’s blessing and—to some will be—its curse. If you’re not a fan or somewhat familiar with the works of H.P Lovecraft and Mary Shelley, you’ll very likely not care much for the resolution and be left with more questions than answers. But if you are, even though you don’t know where things are heading most of the time, this payoff is worth everything at the end. As if the ending wasn’t enough, I fell in love with the characters deeply through the book. The story is told from the first-person perspective of Jamie, and it’s quite delightful how King draws the story out until the characters in Jamie’s life are old and some even die in different situations, he makes you care deeply for them and you feel like you have lived a life with them. As a side note, this was my second Stephen King novel this year. I also read Salem’s Lot not long ago, and I must say that this gave me a perspective on King I didn’t expect. He has progressed greatly as an author, Revival contains none of the bloated sentences and dragging narrative of his early work. The text is clean, concise and always engaging. In the end, Revival is a wonderful book where the plot is beautiful, the characters are rich, and the story is engaging. It draws you in straight away, and in the end leaves you breathless not only through its conclusion but also as a meditation on aging, obsession, and fanaticism. All this with a proper dose of Shelley and Lovecraft for good measure. What’s not to love?